Remote working – a win/win for everyone? Recently I’ve been completing an assignment for one of my masters modules “contemporary issues in the workplace”, we could choose any topic we wanted and I decided to do mine on remote and mobile workers. The main reason for choosing this area is for the past 11 years I’ve been one of these workers, 5 years employed and 6 years as self-employed. Having read a number of research papers on this subject I thought I’d share with you some of the interesting points that were raised in the research that we might be able to apply to ourselves and our employees to help improve health and wellbeing of this slow but growing working population. In some of the early papers I read (early 1990s) they were predicting that over 75% of employees would be remote working by this time (2017) when in fact the number is pretty low, in 2014 it was estimated roughly 4.2 million people were classed as home workers about 13.9% of the working population (Labour Force Survey, ONS 2014)!! Now I think this number is on the low side for two reasons, a: there is no consensus as to what is defined as home/remote/agile/tele working and b: this is a hard to reach group of workers as it includes self-employed as well as employed workers who are under the radar so to speak. In most of the research papers the introductions were very positive and on the surface you would think this type of working is a win/win for both the organisation and the employee! Mainly lower overheads for the organisation and for the employees they get flexible working, more autonomy and better work-life balance, but in truth it’s not that simple as with anything around workplace health and wellbeing and many actually found that remote working had a negative impact on the employee’s wellbeing!! Some of the issues raised included feelings of isolation/depression, disconnection from organisation and work colleagues, lack of visibility lead to feelings of being looked over for work projects and promotions. 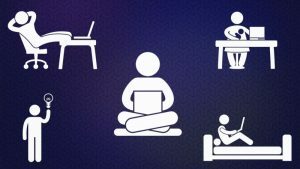 The person – It takes a certain type of person to remote work, someone who is self motivated not only to get on with what is needed to be done but also have the ability to interact effectively with colleagues remotely or go out and find their own networks to limit the chances of isolation. How will you recruit for these position? The role – It might seem obvious but the type of role that can facilitate effective remote working has to be one that can work from any location and be flexible in its nature and one where close management of others isn’t required. The organisation – This is the most important aspect that makes remote working a success!! The organisations culture needs to be an inclusive one to make sure that the remote workers feel part of the team, how can you make them feel part of the team, how will they be treated when they come into the offices? What will you do to make sure they don’t miss out on opportunities and the incidental learnings that happen in the office environment? How will you manage these workers? The infrastructure – What support has the organisation put in place to support remote workers, not just from a technological point of view but also physical like helping staff members to have the desk/workstation set up to ensure good ergonomics and effective working. Also how secure is your network? Do you support a VPN system and what are the procedures if this breaks or stops working? How will you ensure your workers are taking sufficient time for breaks etc. Most also concluded that 80% remote working would be the ideal scenario to allow the employee the benefits of both remote and office working. If you want to know more about how Firecracker can help you create a great remote working policy then get in touch.